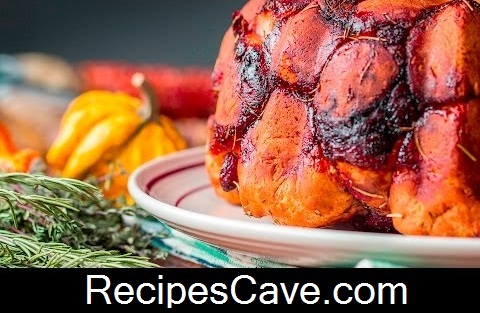 Holiday Monkey Bread Recipe - People who love to cook on their own this recipe will help them to cook holiday bread. Here you will understand how to easily cook monkey bread. Open biscuit dough and separate into individual biscuit pieces. Using your hands (or a knife for extra precision), tear each piece of biscuit dough into 2-3 pieces. Flatten the torn dough in the palm of your hand and place 1-2 pieces of brie in the middle. Pinch dough around the cheese, then roll together until it forms a small ball with the cheese inside. Repeat until all of the dough and cheese have been rolled together. Place cheese-filled doughballs into a standard bundt pan that has been generously coated with nonstick spray, spacing them out evenly. Once a layer of dough has been placed into the pan, sprinkle generously with ⅓ of the thyme and rosemary. After the sprinkling of herbs, spoon in about ⅓ of the can of cranberry sauce. Repeat this (dough, herbs, sauce) pattern until all of the ingredients have been layered evenly in the pan. Bake in preheated oven for 40 minutes. Loaf should be fragrant with cheese and cranberry sauce should be bubbling on top when removed. Let cool for 10 minutes before covering and inverting the bread onto a large serving dish. your Holiday Monkey Bread Recipe is ready to eat.